Advance Registration for AAOP 2018 is now closed. You may register onsite at the Palmer House beginning on Wednesday, April 25, 2018 at 1:00 PM CDT. 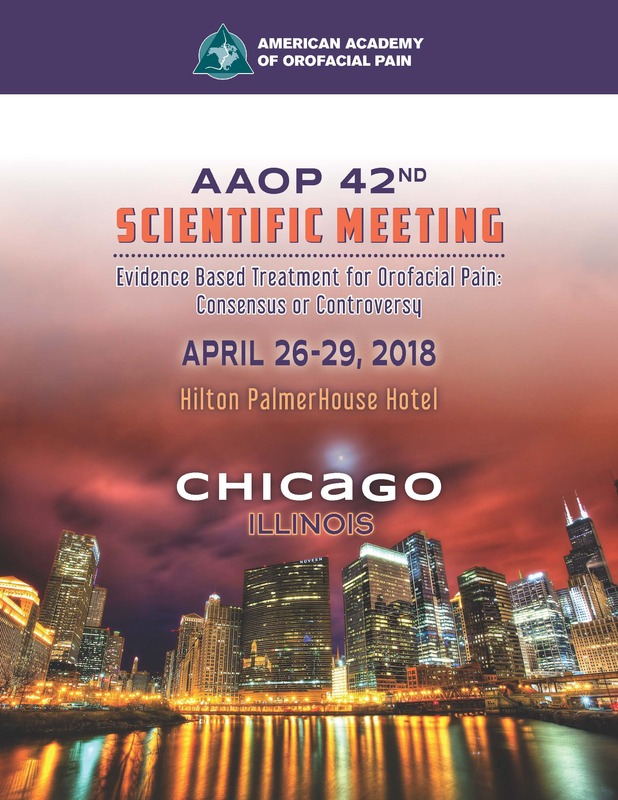 The AAOP Scientific Meeting prohibits the marketing or promotion of commercial products and/or services in conjunction with CE activities. Commercial Products and literature are to be confined to the exhibit hall and are not permitted in the lecture hall. Due to the professional nature of this meeting children are not permitted in either the lecture hall, exhibit hall or poster viewing areas. Business casual attire is appropriate for this meeting. This hands-on day (5.5 hr) course will provide participants with an Evidence Based Approach to the evaluation and treatment of the patient, with temporomandibular pain (TMD). It will include a comprehensive presentation on the most updated findings related to sensory and motor impairments in TMD. Evidence has shown the role of muscle and joints, and impairments in motor control strategy, which has set the stage for a multisystem approach to the evaluation, treatment and management of patients with TMD. New models including neurophysiological changes in the nociceptive system and descending inhibitory systems will be covered. The research and efficacy of manual therapies is phenomenal. Come and find out why "muscle and joint tissues" will work in the long run, integrating their inputs into the brainstem. You may have already heard about muscle pain or the TMJ and perhaps you've read about the importance of the cervical and spine in TMD. This course will bring all the elements together in a way that will make anatomical, biomechanical, neurophysiological and, more importantly, clinically applicable sense. Learn how to assess for joint and muscle tissue dysfunction and pain inhibition with repercussion on the "pain neuromatrix" of the brainstem. Synopsis: This year’s AAOP Sleep Medicine Pre-Conference has a varied listing of topics which include both reviews and updates. As is customary for this program both sleep and pain are the emphasis of the varied presentations. To adequately understand sleep mechanisms and sleep neuroscience the clinician has to have a good understanding of the nervous system itself. Dr. Paul Grin will be doing a review of the neuro-exam and how the function and or dysfunction of the cranial nerves interplay with normal sleep and sleep disturbance. For the orofacial pain clinician it is imperative to recognize the presence of SRBDs in their pain patients so that appropriate clinical management to be implemented. Dr. Davis Thomas will review Sleep Related Breathing Disorders for those individuals who may be new to the field of sleep medicine and the sleep pain paradigm. He will also present on literature updates for Obstructive Sleep Apnea (OSA) and how it may pertain to the management of an orofacial pain patient. Dr. Andrew Smith will review the literature on sleep and chronic pain. How the two disorders are associated differs from person to person. Is pain an expression of, or made worse by, a sleep disorder and or sleep disturbance or is pain itself creating the poor quality of sleep? As such it is important to make the distinction to adequately address your patient’s sleep/pain issues. Dr. Steve Bender will do an update on sleep bruxism and how OFP clinicians need to address this, at times, very problematic issue. Elmer A. Villalon, DMD will review two articles of the current literature. Review articles are yet to be determined. To help practitioner achieve both clinical and business success of clinical practices in the field and to improve access to care for these patients. 1. Enhance business success of participating clinicians by integrating best practice business services for each clinic. These services include understanding electronic medical records, revenue cycle management, business development, marketing, bundled services, third party contracting for services, human resources management, and practice assets provided by each clinic. 2. Enhance clinical success of participating clinicians by providing training in clinical protocols that are profitable and evidenced-based, patient-centered, integrative, and transformative in providing care for the wide range of orofacial disorders and to document successful outcomes of the care. 3. Learn to implement these clinical and business best practices to help participating dentists develop a high quality financially successful practice with consistent evidence-based care, marketing of services, shared electronic health records, consistent documentation, improved reimbursement, and detailed dentist and staff training. 4. Increase access to care for patients with orofacial disorders by bringing together clinics into a network to provide comprehensive services to the clinics and ensure their success in caring for these patients. This presentation will discuss how to use your orofacial pain expertise to add a new dimension to your practice by evaluating and/or treating injured workers. All 50 states have evaluations of injured workers. Injuries to the head and neck often result in TMD, trigeminal and facial nerve injuries, facial fractures, facial lacerations and teeth injuries that may result in disability, and/or treatment. Injuries to other parts of the body can have compensable consequences to the orofacial region through chronic pain, disturbed sleep or the effects of medication. Oral Facial Pain specialists have the necessary skills to perform these evaluations. During the lecture appropriate literature will be presented to support treatment executed and contrary literature will also be presented. A patient was diagnosed with hemicrania continua but they don’t respond to indomethacin. What next? A patient complains of pain with chewing and it is getting progressively worse. It is simply myalgia or something else? How can you quickly assess this patient? What one word helps differentiate a migraine from a cluster? What are simple acronyms you can use to remember the ICHD criteria for migraine, for TTH, for the TAC’s and for the Other primary headaches? Learn all of this and more during breakfast with Dr. Hirschinger. Snoring, Upper Airway Resistance Syndrome (UARS), and Obstructive Sleep Apnea (OSA), are gaining more attention in the field of dentistry since they fall within the spectrum of Sleep Related Breathing Disorders (SDB). More articles are appearing in the dental literature concerning SDB and the dentist’s role in diagnosis, treatment, and management of these disorders. Sleep disorder breathing varies greatly in its’ clinical presentation. This requires the dentist who chooses to treat SDB to be thoroughly familiar with the developmental anatomy and physiology of the pharynx and the relationship of the stomatognathic system with the physiology of swallowing. This presentation will include a discussion of the embryology of the airway and the neuroanatomy and neurophysiology of swallowing and the role of speech and the dissension of the larynx in humans. The unique features of modern man’s oropharynx will serve as an introduction to the topic of SDB. To help practitioners managing severe headaches with a new technology and procedure -- Utilizing Tx360 to perform Nerve block of Pterygopalatine Ganglion branch of Trigeminal Nerve. 1. Review of Anatomy and Physiology of Pterygopalatine Ganglion/Sphenopalatine Ganglion. 2. Illustrate the techniques of Nerve Block of Pterygopalatine Ganglion branch of Trigeminal Nerve with Tx360 device. 3. Discussion of Headache prevention with Tx360 technology when used in repetitive nerve blocks for Pterygopalatine Ganglion branch of Trigeminal nerve. This lunch and learn session will cover the examination and treatment of dizziness frequently encountered in dental and TMD practices. Many vestibular conditions are easily diagnosed and treated. The patient’s head position during dental treatment can often cause Benign Paroxysmal Positional Vertigo (BPPV). Participants will learn effective bedside treatment of BPPV through recognition of nystagmus patterns. Additionally, other potential causes of dizziness, including Vestibular Hypofunction, Cervicogenic Dizziness, Central Nervous System Disorders and Migraine Associated Dizziness will be discussed. he discussion will focus on medications used in the management of orofacial pain and clinical pearls associated with their use. Medications for neuropathic pain will be emphasized. Considerations for use will include drug-drug interactions and any new evidence for their relative effectiveness. Medicare DME is nothing to be afraid of, the rules are outlined and are not as intimidating as its bad reputation would lead you to believe. Join Lesia Crawford from GoGo billing for a lunch and learn where she will break down the specific requirements by Medicare and review the required forms needed to be in compliance. Even if you are not billing OAT to Medicare, your cases should be Medicare proof as most commercial plans turn to Medicare when setting their own guidelines for coverage. Also learn the secrets to unlocking maximum reimbursement for your Medicare patients, not all plans are created equal. Sample forms will be provided. •	Technique for injecting botulinum toxin into masticatory muscles for management of pain. A review of current literature on the mechanism of action of botulinum toxin and its efficacy and safety for management of refractory masticatory myalgia. In addition, overview of technique for injecting masticatory muscles, and selecting appropriate patients of refractory masticatory myalgia for Botulinum toxin is a neurotoxin that has recently gained popularity in management of chronic pain disorders, including refractory masticatory muscle pain disorders. This lecture will present the current literature on the mechanism of action of botulinum toxin, and its efficacy and safety for management of refractory masticatory myalgia. In addition, it will review the technique for injecting masticatory muscles, and selecting appropriate patients of refractory masticatory myalgia for botulinum toxin injection therapy.botulinum toxin injection therapy. Total credit educational hours being offered at this conference are 26.25 (including core conference, preconference workshops, breakfast forums & lunch sessions). The core conference offers 15.25 CE hours. Each preconference provides an additional 6 CE hours, each breakfast forum provides 1 CE hour and each Lunch and Learn provides 1.5 CE hours. Each attendee should claim only those hours of credit that he/she actually spent in the education. Workshops, breakfast & lunch sessions all require additional registration.